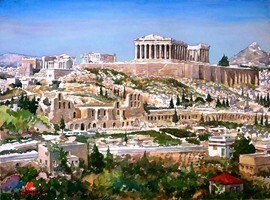 The Acropolis of Athens is made more visually appealing by the Parthenon but it is not Parthenon alone that makes the Acropolis. There are historical signs that can confuse even the most experienced and veteran archaeologist and it is still undecided since when the architectures on that hill top are there. There are signs to indicate Bronze age structures still stand there and some may be older than that but they are not yet clearly identified from their ruins. 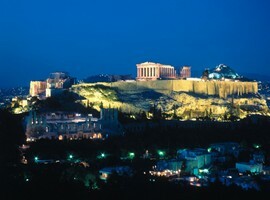 To the aura of the Acropolis has been added beauty of Athens and the place is still considered the abode of the ruling lady of Athens, Athena. 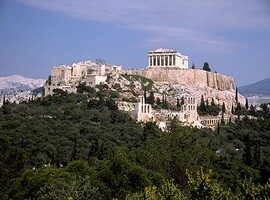 All along Greece there are also other places bearing the name Acropolis and the Acropolis of Athens is considered the prime one among them; to designate it is simply called The Acropolis. The architecture in this region though has a long time period of building or destroying and there is still the remarkable architecture of the region apparent in those buildings. Classical Greco-Roman structures with their imposing heights and straight columns have been the specialty that survived through millenniums. 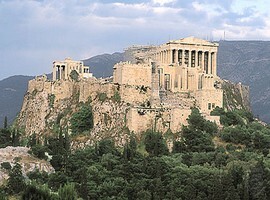 Covering an approximate area of thirty thousand square meters and raising above the sea to a height of five hundred feet the Acropolis is gigantic in dimensions. The evidential proof says that human beings first dwelt on this area nearly six thousand years ago. Mankind was changing postures then; the more interesting and more vivid signs of living on the mountain top came in the later stages of Bronze Age. No doubt this place is so involved in the history of the region it is not surprising that they will call it the god’s temple. A gigantic wall surrounding the area was found in ruins which made this a formidable fort of a kind and protected the inhabitants for quite a long time. Though it is considered a safe and fort like structure to protect valuables it is assumed that the place was an alternate city with independent water resource and facilities for nutrition. Parthenon in being the central structure of the place indicates that religion was a vital part of the life of people of that time. There are also other two structures of similar importance in The Acropolis of Athens, the Erechteion and Athena Nike’s temple. 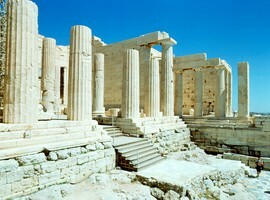 The temple apart from being that of the patron of the city of Athens was also considered a place for worship of festivities of fertility. 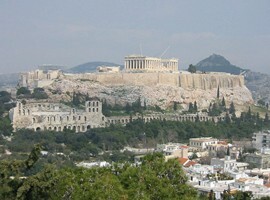 Evidences indicate that there were many more constructions that existed in the same region and were destroyed at one or other invasion that Athens went through till the recent times of early twentieth century in First World War. Some of the structures seen in present days were constructed in the vacant lots created by the destruction of invasions. 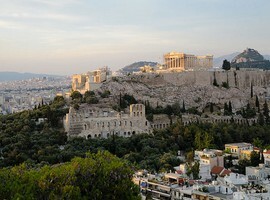 To reverse the clock of those invasions in later time of a hundred years there were haphazard restoration works carried out and some beauty of the Acropolis was spoiled. In some more time came the Romans and with them the Byzantine influence was found in the region. 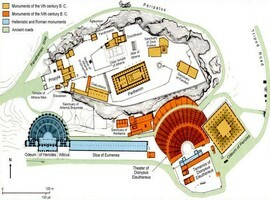 Persian invasion which took place before the Romans and also before the restorations was one of the most destructive periods on the Acropolis of Athens. 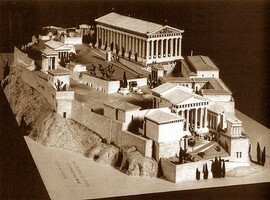 In continuation of the reconstruction it was also decided to restore the military advantages of the place and so the boundary wall was restored completely and this is what was used most by the Byzantine Empire apart from converting the Acropolis of Athens from the abode of Athena to church of mother Mary. The military facility was more used by the Turks of Ottoman dynasty more significantly and made this a significant naval power. Since the Turks were Islamic in their religious beliefs there was also a mosque built for the worship of people in the city. 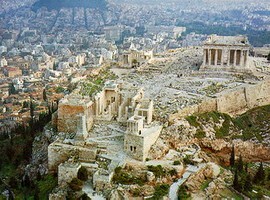 There were more modern destructions on Acropolis in the time of the Ottomans and some of the restorations of the large history and legacy were preserved properly for the first time. In the foothills inside the boundary walls there are some more significant buildings apart from three mentioned before. The democratic nature of the buildings in their non religious character ( there is an open air theatre, shaded passageways and a musical theatre also) indicate that there was an active social live all along in this fort city. Every visitor to this ancient city finds something unique and even today the city is open to destruction. The urbanization, industrial pollution, corrosive sea weather and some more human effects are causing the new destruction. The government is trying with experts to scientifically restore the complete place and there are still no definite solutions; naturally there is no proper direction and speed to the process. Even now it is still worth a view of a million lives. 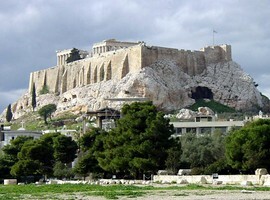 By coming in the gambit of international archaeological department the place is found some support and muscle to prohibit human interference in and around The Acropolis of Athens. There will be many other beauties of similar measures but it is hard to find tangible history of such a long time at a dingle place. The place is not only about some architectural beauties but this is also the millennium old story of mankind of a special kind who in spite of the surrounding violence and other brutal happenings around them (remember Sparta of that time?) could resolutely hold their belief in more fine qualities of art and culture. In forming statues and structures that in spite of imitating life did not lose their beauty. If negligence allows the Acropolis to destroy a better part of human stories of courage and bravery to pursue truth will also be destroyed and when in a few years the world in rudderless desperation look for inspiration to believe and love there will not be a golden structure on a mountain hill in the morning sun to tell them that ever since a species started walking in two feet there has been bad dark times but life has always hold its beliefs. Time we preserve that belief. 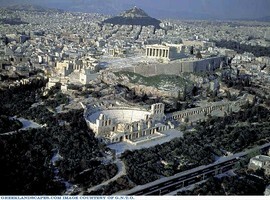 Time we preserve the Acropolis of Athens.